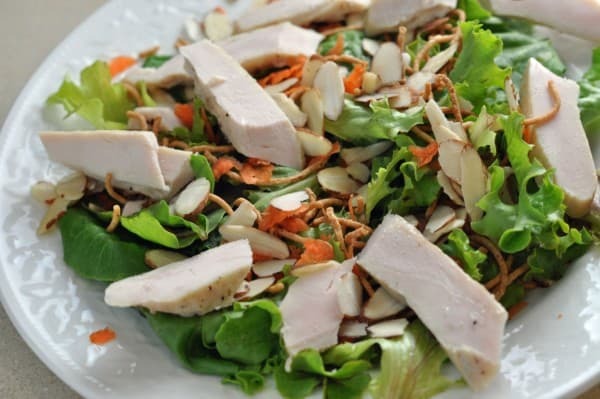 Applebee’s Grilled Chicken Oriental Salad has to be one of my most requested recipes. Honestly, I can’t think of a recipe that has been requested more. Applebee’s has been serving the Grilled Chicken Oriental Salad for years now, and this is a restaurant that is known for swapping out their menu on a fairly regular basis. What makes this salad so special? Crisp rice noodles, toasted almonds, and fresh lettuce are served with an Asian-style dressing. Applebees Grilled Chicken Oriental salad is a great light salad Applebees serves. Heat the grill to medium, or heat a cast-iron skillet or grill pan over medium heat. Place the chicken breasts between two sheets of plastic wrap and gently pound them to 3/8-inch thick. Brush with the olive oil and season them with salt and pepper. Grill for 5 to 7 minutes on each side, until cooked through. Transfer to a plate to rest for 4 to 5 minute before slicing. Toast the almonds in a small dry skillet over medium heat. Watch them carefully—there is a fine line between toasted almonds and burnt almonds! Shake the pan gently. When you begin to smell the almonds, toast for a few seconds more, then immediately place the almonds on a paper towel. Allow them to cool for a moment or two. Assemble salads by first putting down the lettuce, 3 to 4 cups per serving. Sprinkle each with 2 tablespoons of the carrots, 1/4 cup crispy rice noodles, and 1/4 cup toasted almonds. Arrange the chicken on top. Serve with plenty of the Applebee’s Oriental Salad Dressing. Variations Now, Applebee’s Grilled Chicken Oriental Salad is a delicious salad, but there are a few variations that I like to make. I like to change out the lettuce and use a mesclun mix. I also like to add a few mandarin orange sections and sprinkle some thinly sliced green onion or scallion on top, for my personal version of the Applebee’s Grilled Chicken Oriental Salad. What changes do you like to make when you make a salad? Do you like any unusual ingredients on your salads? You can find many more copycat restaurant recipes that taste just like Applebee's Restaurant Recipes here at CopyKat.com. Since you are making copycat recipes how about one for Applebee’s dressing for oriental salad! That sounds great! I am going to try it. Thanks! I love to buy broccoli slaw, (usually right next to the coleslaw. bagged mix), & serve it with Marie’s teriyaki dressing with toasted slivered almonds & crunchy noodles. Yum! It last about 3 days (if we don’t eat it the same day! Try it, you’ll love it ! Sometimes we eat it as lettuce wraps inside the romaine…. just an idea. I do LOVE your CK Applebees oriental copy though, it is delish! Thank you for this recipe! If the question is what is teriyaki sauce, teriyaki sauce is type of sauce. You need to purchase it. I am in love your copykat recipes. I have tried your several recipes and all gave similar taste like restaurant. This is one of my favorite salad and I am going to make it soon. Their dressing is made from pureed chicken fat. That’s why it’s difficult to reproduce the flavor with traditional salad dressing ingredients. You can buy Applebee’s dressing….just ask for some. I paid $4 for two small bowls. But worth it for the taste! You are missing the shredded regular and purple cabbage, and shredded carrots. I was sitting here, eating my leftovers from Applebees, and took note of this. Looking forward to making my own at home! Yes, Robin. The salad mix of the Oriental salad is half romaine and half dry slaw, you can also but this bagged in the salad section of the super market. I used to work for a franchise of Applebee’s. The Applebee’s by me don’t use Romaine at all….It seems more like Napa Cabbage and possibly another type of cabbage(maybe bok choy) that has been shredded/juliennned with some purple cabbage, shredded carrots and almonds and crispy noodles for garnish…it is by far my favorite salad at Applebee….LOVE the dressing….